Antique Early German/Bohemian Blue Glass Beer Stein w/Enamel c. Description: This very interesting stein was made around late 1830s - 1840s. Steins made before 1850 are considered "early" stein - the steins made in pre-industrial times. The stein is made of blown dark blue crystal glass with applied heavy handle and large pontil mark on the bottom. The steins of this kind came mostly from Bohemia - now Czech Republic. The stein is very nicely decorated with white, gold, green and orange enamel crteating beautiful floral ornaments. The lid also have five-ring closed type hinge, typical for the period, and the thumblift sitting on the lid. There is also the original foot ring. The stein is in excellent condition - there is some minor age-realted minor scuffs on the pewter, other than that there is no chips, lines or repairs. It is very impressive and stylish, standing 9.5 tall to the top of the thumblift, 1L capacity. 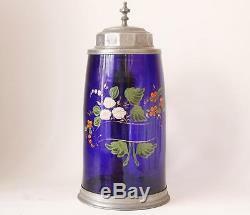 The item "Antique Early German/Bohemian Blue Glass Beer Stein with Enamel c.
1830s" is in sale since Sunday, June 11, 2017. This item is in the category "Collectibles\Breweriana, Beer\Drinkware, Steins\Lidded Steins\Germany". The seller is "beer-stein" and is located in California.